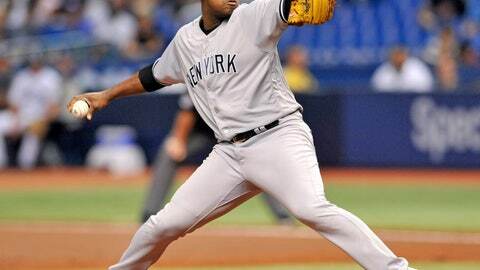 NEW YORK (AP) — Luis Severino gets a wild-card do-over. After getting just one out for the New York Yankees against Minnesota last year, Severino starts this year’s winner-take-all matchup against the Oakland Athletics on Wednesday night . Severino was chosen over J.A. Happ and Masahiro Tanaka despite a second-half slump. Rookie manager Aaron Boone said he made the decision after a staff meeting Saturday, slept on it and finalized it the next day . “I think he’s equipped in so many ways to handle this, and perhaps most importantly, he’s equipped with amazing stuff and the ability to dominate big league hitters because he’s such a talented pitcher,” Boone said. Severino left last year’s wild-card game trailing 3-0 after allowing four hits and a walk. Chad Green, David Robertson, Tommy Kahnle and Aroldis Chapman combined for five-hit relief as New York rallied for an 8-4 victory. A 24-year-old right-hander, Severino was 19-8 with a 3.39 ERA and 220 strikeouts. He was 14-2 with a 2.31 ERA at the All-Star break but lost six of his next nine decisions before beating Boston and Tampa Bay in his last two outings. He lost 8-2 at Oakland on Sept. 5, allowing six runs — five earned — and six hits in 2 2/3 innings. He threw two wild pitches and Gary Sanchez had two of his major league-high 18 passed balls . The wild-card winner advances to a Division Series against Boston starting Friday. Boone is including Happ, Tanaka and Lance Lynn as part of a nine-man bullpen Wednesday. Severino rebounded last year to beat Cleveland in Game 4 of the Division Series, getting a 5-0 lead and allowing three runs and four hits in seven innings. He lasted four innings in Game 2 of the Championship Series against Houston, a game the Yankees lost 2-1, then gave up three runs over 4 2/3 innings in the 7-1 loss in Game 6. Locating his 98 mph fastball is key. New York went 100-62, its best record since winning the 2009 World Series, and became the 10th big league team that won 100 games and failed to finish first. The Yankees set big league records with 267 homers and 12 players with double-digit home runs, becoming the first team to get 20 or more homers from all nine slots in the batting order. In his first season after New York acquired him from Miami, Giancarlo Stanton led the offense with 38 homers and 100 RBIs. This will be the first postseason game of his nine-year big league career . Yankees games on their YES Network averaged a 3.60 rating this season, up slightly from 3.57 last year and the highest since 2012, but viewers dropped from 334,000 to 326,000.